The Oval in Dunster (Somerset) on West Street, a historically fascinating, quirky cottage, once an open ‘hall house’ believed to date from the 1400s – one of the oldest buildings in Dunster. 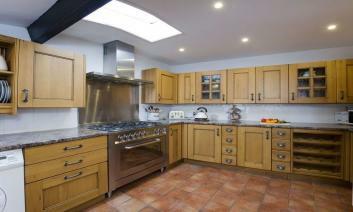 Now beautifully upgraded, furnished and decorated whilst retaining charm, history and wonky floors. At the back, small courtyard (table/chairs) and, up steep steps (gate, handrail), decked patio (table/benches) with lovely views over the village to wooded hills. Downstairs, tiled/stone floors (rugs), ancient timbers, leaded windows, low lintels, beams. Behind a heavy timber door, oak-screened hall, off which comfortable living room (Smart HD TV/DVD/Netflix) with fireplace (woodburner). Snug with easy chairs - a quiet reading room. Two steps up to the breakfast/dining area with French windows to the courtyard and smart oak-fitted kitchen (dishwasher, washing machine, microwave, fridge-freezer, range-style electric cooker). Behind a low medieval doorway, a utility room (tumble drier, sink) and cloakroom (loo), good for wet coats/boots and dogs. Stairs (stairgates) up to three bedrooms – step up to a beautiful double (four-poster bed) with door to shower-room (suite, also accessible from landing), 2 steps up to a twin, and another double (footboard) with en-suite bathroom (suite, shower over bath); both double rooms have vaulted ceilings, cruck beams, good fabrics, window seats. Permit provided for reserved parking space in Nat. Trust car park; second space in private car park, 450 yards. A lovely house in a beautiful village. 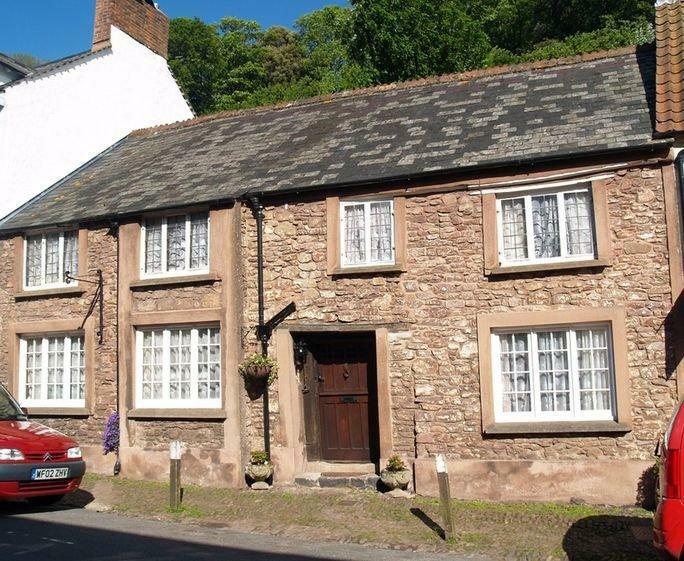 The Oval in Dunster (Somerset)  has a security deposit of £200 is required when booking this property, it will be returned to you 48 hours after your stay providing the owner does not discover any damage or breakages. There is small terrace outside the dining room/kitchen. There are steep steps (handrail) up to a decked area with views out to the village and church. The rest of the garden is private. 1. Parking is in a reserved parking space. Parking for 1 standard sized car. This space is within a privately owned car park 450 yards away. 2. Parking is in a public car park. Parking for 1 standard sized car. A parking permit is provided for this car park owned by the National Trust. Dunster: one of the West Country's prettiest large villages in exceptional countryside, its castle on a wooded hillside standing romantically over its lovely main street. Ancient buildings, cottages; interesting shops; fine church; famous Yarn Market; good pubs, restaurants and t...ea rooms. Exmoor's heather hills, 6 miles; the sea/sand, 1 mile. Minehead (small resort town, sandy beach, steam railway, golf), 1 mile. Train station is not specified. Sarah didn't write a comment. What a lovely cottage! Lots of attention paid to details, lots of information and lovely decorated. Prime location, at the foot of the castle, couldn't be better. Very charming, period cottage. Would highly recommend staying here. Fabulous accommodation - great attention to detail. Will certainly book again. Had a super holiday mainly due to the brilliant cottage. Andrew didn't write a comment. We have had the privilege of staying in this old cottage for the week. Steeped in history it's truly fascinating. We have already decided to come back. It has been sympathetically renovated with all mod cons but without losing any of the character. Being in the centre of Dunster it has easy access to the woods behind the castle for walks, our dogs have had a wonderful time. There's a courtyard tiered garden with pleasant seating areas. There are , being old, different levels and steps everywhere but you soon get used to them. We didn't find traffic noise a problem, and we are not used to any traffic noise, as the property has secondary glazing and we slept in the front. Even the recycling lorries weren't a problem at 7 in the morning! It's a delightful homely place and we were delighted with it. Wheelchairs would probably be a problem but my husband was on crutches for the duration and he got around the property fine. Definitely worth a stay. Thanks Lucy.